Ceramic system for removal of oil and suspended solids from water. Systems are delivered in 316L or higher-grade steel qualities and according to ATEX. 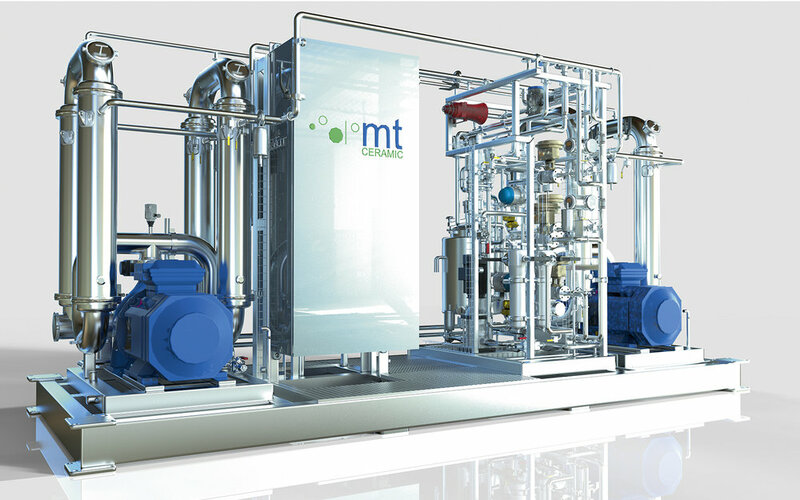 MT Separation has worked with oil/water separation since 2004 – onshore and offshore. Our systems are built according to customer specifications. We use ceramic Membranes to remove oil and suspended solids from oily water. The permeate (clean water) normally contains less than 1 ppm oil. Oil is concentrated making it possible to enhance oil recovery. Water soluble compounds like salts remain in the permeate. Preparing fracking water from produced water or reuse of fracking water is a challenge today. First we remove heavy and large particles in an automatic self-cleaning filter. This water is treated with ceramic membranes to remove oil and suspended solids. The recovery rate depends on the quality of the feed water – 90-95 % is possible. The steel in contact with fluid is normally 316L with options of Super Duplex or SMO, if the corrosion potential is high. Frames and other parts are normally in AISI304. Electrical components can be specified by our customers. MT is able to build equipment according to ATEX standards.